If you wake up and the only things you remember about the previous night are some dancing aliens, a large, black lizard with fluorescent pink spots, and a self-propelled rubber ducky on wheels, it must be Philly Fringe Festival time. Last night I got to see the amazing Brian Sanders and company perform Patio Plastico, a show created for the 1999 Fringe and “re-imagined” for 2005. Though not as cohesive as last year’s AdShock, Patio Plastico is still pretty amazing. These people can do some unbelievable things with their bodies, and that alone makes their productions worth watching. Throw in a set full of surprises (at University City’s Cinemagic!?!) and an inspired selection of music from Bach to Roy Orbison, and you’ve got a Fringe winner. If you get a chance, Patio Plastic is definitely worth the $20. Of course, I went pre-Fringe and saw it for $10. PS How did I not know that each Fringe festival kicks off with a toilet tricycle race? 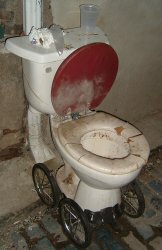 That explains at least one of last year’s mysterious commodes. Hey, “that guy on stage that you never see”–I hope I didn’t give the impression that Patio Plastico was bad in the previews. Not at all–it was great. Ghettomagic? Aside from some sketchy bathroom facilities, it wasn’t too bad. The set was pretty phenomenal considering the constraints.